We are about to witness the true capability of Social Media and Web 2.0 in changing our lives, when Facebook partners with the Department of Elections in Sri Lanka (DOESL) this year, to conduct the worlds first legitimate parliamentary election using the Facebook Connect API. Thanks to a memorandum of understanding (MOU) signed by Mark Zuckerberg (the CEO of Facebook) and Sri Lankan elections chief Mr. Dayananda Dishanayake; millions of Sri Lankans living abroad will be able to vote in the upcoming Sri Lanka general election, by simply logging into their Facebook account. This will mark the history as the first time a social networking site is used for conducting a serious poll, like a parliamentary election. The system will work with the standard Facebook Connect API, with few advance security features enabled, to avoid any interceptions during data transmission from user PC’s to the elections department servers. Sri Lankans living abroad, can login to www.slelections.gov.lk on 8th April 2010, to see a special link placed on the website as “Connect with Facebook to Vote Online”. Clicking on this link will authenticate the user, and they will be prompted to enter the Sri Lanka passport number, to verify as a legitimate Sri Lankan voter. A combination of one Facebook account and one Sri Lanka passport can caste a vote in the election. Thereafter, the system will block your Facebook account and the passport number, if you make any further attempts of voting. Speaking at a press conference to brief the media about this arrangement, young entrepreneur Mark Zuckerberg said “this is the next level of of Facebook’s endless endeavor of being truly a social utility”. He further added, that he tried to introduce this system to US elections department during last presidential election, but the (then) ruling party Republicans lobbied against the bid, citing the possible disadvantages senator McCain would have received, given the massive popularity earned on Facebook by Democrat candidate Barack Obama. “However, Sri Lankan government responded positive, when we offered them the system. Two global commercial banks operating in Sri Lanka, which has major experiences in dealing with the Sri Lankan government in some oil hedging deals, and short-term government borrowing, played an intermediary role in making this a deal” said Mr. Zuckerberg, when asked about the intermediaries involved in taking two parties to an agreement. He refused to reveal any pricing details of the deal, and how the payments were handled by these two banks. Speaking in the same press conference, Mr. Dayananda Dishanayake told the media that, he is at last relieved that a reliable system is installed in his department, after dealing for years with the inefficiencies of locally developed software to manage elections. “Finally, now I can retire and go home with peace in mind. If someone complaint about computer “gimmicks” in this election result, now I can ask them to file an “abuse” report to Facebook, by simply clicking a button”. Meanwhile elsewhere in Colombo, the Marxist opposition party JVP called a press conference, objecting this as another undemocratic move by the Rajapakshe regime. Speaking in the press conference, the JVP leader Mr. Somawansa Amarasinghe told the media, “This is another western conspiracy to challenge the sovereignty of our motherland. Facebook is an American company, and it represents the neo-colonized, capitalistic evil forces of the west”. We contacted Mr. Thissa Attanayake, the general secretary of UNP; the major opposition party in the island nation, to know their response towards this move. 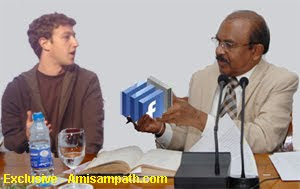 “We have strong evidence to say that, Basil Rajapakshe owns a sizable stake in Facebook shares. He bought these shares, to the name of a senior Vice President of Facebook Inc, named one Mr. Chamath Palihapitiya, who is a native Sri Lankan. Chamath is the son of a first cousin of Basil’s ex-girl friend during school days. This is another shameless move by Rajapakshe brothers, to bring in their relatives to powerful positions in this country, and make this a family regime. See what has happened? Even the election department is going to be run by someone linked to the Rajapakshe family”. *If you are sill believing this is true, please check the date stamp for this post and check who is the April fool!